Evolved to accommodate Alpinestars class-leading Tech-Air Race system and featuring innovative new external protection technologies, the GP Tech V2 Leather Suit is constructed from premium kangaroo and bovine leather for unsurpassed abrasion and tear resistance. Fully optimized for use with or without Tech-Air, the GP Tech V2 incorporates aramid fibres and accordion stretch panels for an anatomically profiled racing fit. 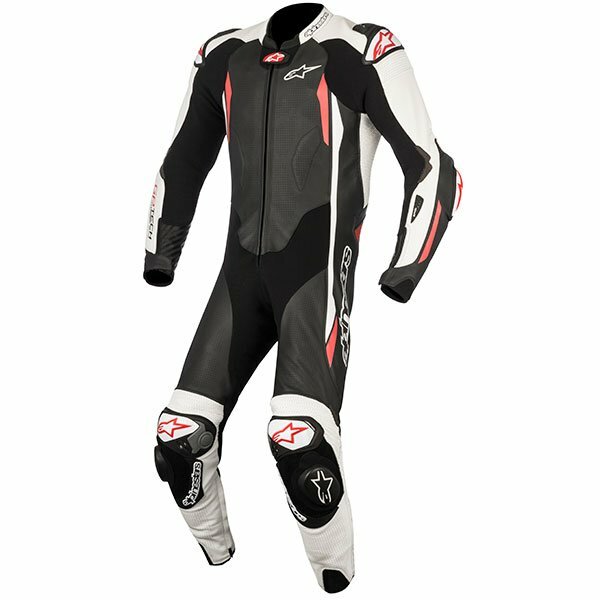 The suit incorporates class-leading internal protection as well as reinforced stitching throughout and strategic stretch panelling for the ultimate in high performance riding comfort, security and fit. Alpinestars, a truly world class brand of motorcycle apparel. Founded in the early 1960s by Sante Mazzarolo, Alpinestars has grown to be a world leading manufacturer of professional racing products such as leather jackets, jeans, boots and 1 piece suits. Whilst their leathers are worn by some of the biggest names in bike racing, they also specialise in high performance textile jackets, jeans and gloves. From F1 to Karting, the World Rally Championship to NASCAR, Alpinestars work with the very best drivers and riders to bring design innovations to all aspects of professional motor-sport.